Jackpot, Nevada is an Unincorporated Town in Elko County, Nevada. In 2010 it was estimated to have a population of 1,191. Located on the Idaho/Nevada border on U.S. Route 93, Jackpot has been a popular casino gaming destination for residents of Idaho and other neighboring states since its founding. Jackpot is located approximately 45 miles south of Twin Falls, Idaho, a city of approximately 40,000. Although officially part of the Elko Micropolitan Statistical Area, Jackpot is often considered part of the Greater Twin Falls region. After Idaho outlawed all forms of casino gaming in 1954, “Cactus Pete” Piersanti and Don French moved their slot machine operations from Idaho to the Jackpot townsite. 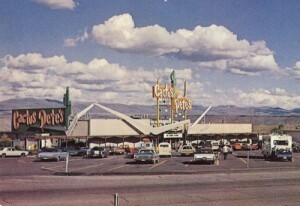 Piersanti’s and French’s gaming establishments were named Cactus Pete’s and the Horseshu Club respectively. Piersanti in particular is credited for founding Jackpot as well as for naming it. Cactus Pete’s management took over the Horseshu in 1964 to form what would eventually become Ameristar Casinos. The Ameristar-owned Cactus Pete’s and Horseshu, as well as the independent Barton’s Club 93 and the Four Jacks Casino, form the basis of the town’s economy to this day. Collectively Jackpot-area casinos are the largest employer in southern Idaho. In addition to its casino industry, Jackpot has its own schools, golf course, and post office.